There are two statistics that are fundamental in the study demography – birth rate and death rate. It is essential for students to have a working knowledge of these two figures, as they serve as the building blocks for understanding more complex population concepts like growth rate, doubling time, and more. Luckily, understanding these two stats is fairly simple: birth rate refers to the number of births that occur per thousand people, per year. Similarly, death rate refers to the number of deaths per thousand people, per year. Comparing the birth rate and death rate of a given area provides insight into whether that population is increasing or decreasing. When the birth rate is larger than the death rate, we know that more people are being “added” to the area than are being “taken away”, meaning the population is growing. Logic follows then that if the birth rate and death rate are equal, the population is not changing and if the birth rate is less than the death rate, the population would be shrinking (ie. more people are being “taken away” than are being added to the area). Knowing this, we could compare the birth rates and death rates of any two countries, and tell which one has a faster growing population. Let’s take Norway and Tanzania for example. Norway has a birth rate of 12/1,000 and a death rate of 8/1,000 while Tanzania has a birth rate of 40/1,000 and a death rate of 9/1,000. Which population is growing faster? 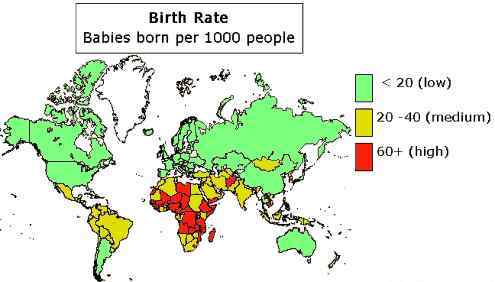 In this case, Tanzania is growing much faster, because their birth rate is much larger than their death rate. Check back soon for a follow up post exploring hands-on ways to teach birth and death rates in your classroom.